McGraw-Hill Education, 2010. Paperback. Good. Disclaimer:A copy that has been read, but remains in clean condition. All pages are intact, and the cover is intact. The spine may show signs of wear. Pages can include limited notes and highlighting, and the copy can include previous owner inscriptions. At ThriftBooks, our motto is: Read More, Spend Less.Dust jacket quality is not guaranteed. McGraw-Hill Education, 2010. Paperback. Acceptable. Disclaimer:A readable copy. All pages are intact, and the cover is intact. Pages can include considerable notes-in pen or highlighter-but the notes cannot obscure the text. At ThriftBooks, our motto is: Read More, Spend Less.Dust jacket quality is not guaranteed. McGraw-Hill Higher Education, 2010. This is an ex-library book and may have the usual library/used-book markings inside.This book has soft covers. In poor condition, suitable as a reading copy. McGraw-Hill Higher Education, 2010. This is an ex-library book and may have the usual library/used-book markings inside.This book has soft covers. In fair condition, suitable as a study copy. Non Basic Stock Line. PAPERBACK. 0071314172 Brand New, Paperback , printed in english , Ready to ship, fast delivery (5-8 busienss days ) worldwide . New. MCGRAW HILL, 2010. .. Brand New. Orders usually ship within 1-2 business days. We use FAST SHIPPING via FEDEX/UPS/DHL and deliver within 3-5 business days with tracking number, no shipping to PO BOX, APO, FPO addresses. Kindly provide phone number for expedite delivery. 100% Customer satisfaction guaranteed! 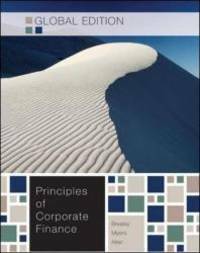 Principles of Corporate Finance [Nov 01, 2010] Brealey, Richard A. and Myers, Stewart C.
New. This is Brand New Original Edition, Excellent Quality, Printed in English Language. Please contact us for any questions regarding this book.! !